While I wasn’t paying close attention, New York Review Books has slipped another novel by Jean-Patrick Manchette into English translation — excellent. Only took them three years, but that is much better than the previous gap of nine years between novels for those of us who don’t read the French language. Now we have four of the ten Manchettes available and only six more to go. Guess I’m going to have to work on living for a few more years, because I really like these books. As I said when bemoaning the nine year gap, Manchette probably isn’t for every crime reader, but ought to suit the taste of Up and Down These Mean Streets regulars. If you surf in searching for Willeford and Kakonis, Red Harvest and noir, you have a target on your forehead and these novels are the bullets in the clip. Found this blurb for The Mad and the Bad surfing around — as you can see, everyone is jumping on the bandwagon, and they should. 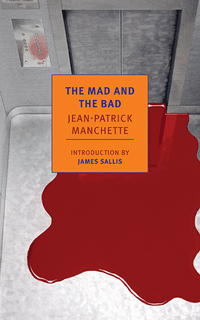 This entry was posted in Lit, News and tagged Manchette, The Mad and the Bad. Bookmark the permalink.